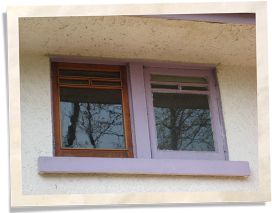 For a time, the Ross House was known by everyone who lived near it as simply “The Purple House.” It had lilac trim on the windows, and there was an odd purple-ish addition that had been added to the front. 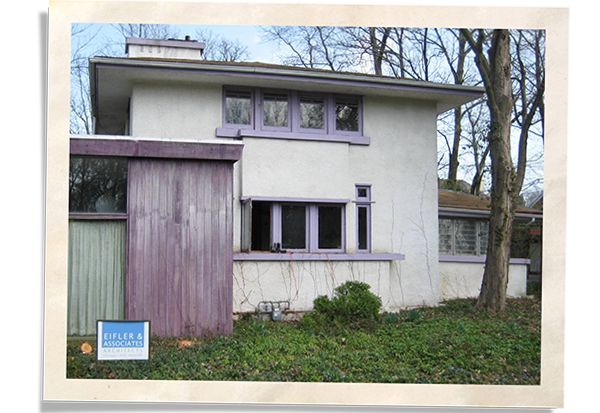 It was an authentic Frank Lloyd Wright house, built in 1916, but its current state was a sad example of neglect. Landmarks Illinois placed the structure on its endangered landmarks list in 2009. When John Eifler bought it a year later, the house had stood vacant for three years and was in such bad shape that no bank would give him a mortgage. Among the many problems, there was no heat or running water. 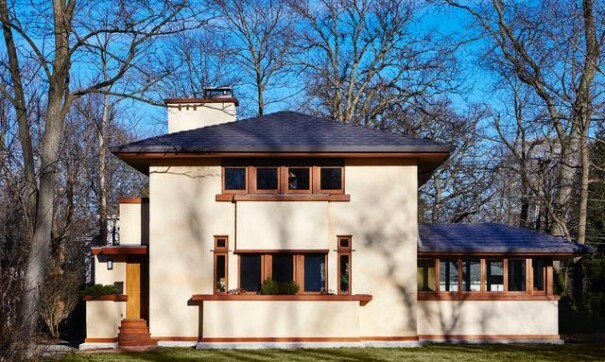 But Eifler had an advantage that most people don’t: he was an architect who had spent his career restoring Frank Lloyd Wright homes with Eifler & Associates Architects. He knew what the house could become. So he persevered, working out a deal with the owner and spent a year fixing it up enough so that the bank would agree to a mortgage. The exterior was covered in an acrylic stucco that didn’t breathe. He removed all of it. He also tore down the odd purple addition on the side. In addition to that, Eifler put on a new roof, installed new plumbing, bathrooms and fixtures. Sustainable upgrades included installing geothermal heating and cooling, extensive insulation in the walls and ceiling, gray water recycling in the bathrooms and placing solar panels on the garage roof among other improvements. The Ross House is a classic Prairie-Style House. 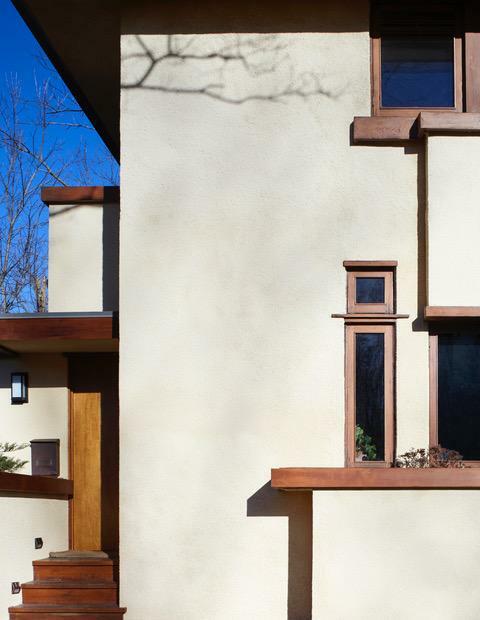 The attention to windows is central to Frank Lloyd Wright homes, which are rooted in the Prairie School Architecture style with horizontal lines that evoke the flat vastness of Midwestern prairies. The homes are built into the surrounding landscape even if it’s a bluff, hillside or waterfall. They always make use of natural light. Bringing the windows back to life was central to the restoration. Eifler and his girlfriend Bonnie removed all 26 windows. They laid them on a workbench, took out the glass and used a heat gun to remove all the purple paint. Then they sanded and stained each one and put them back together. 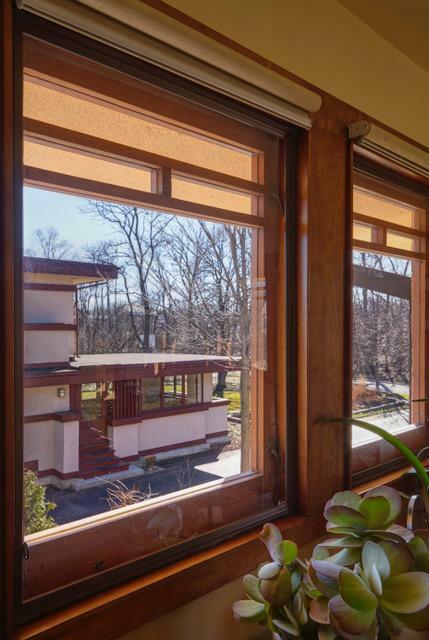 None of them have the art glass Frank Lloyd Wright was known for, but the second-floor windows have ornamental wood mullions. On the first floor, Eifler did some creative things with the windows. 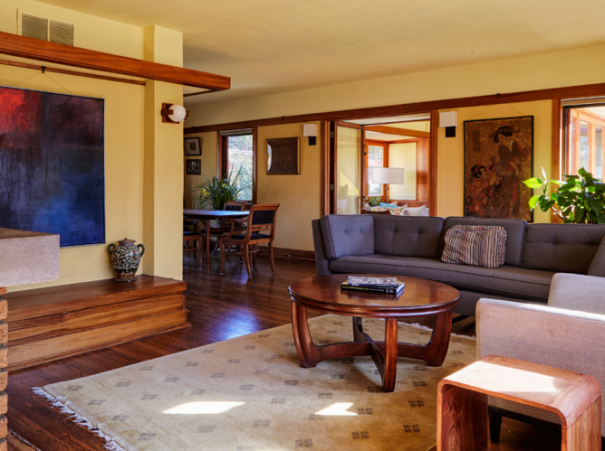 For a room that had originally been an open porch, he designed new windows with piano hinges that fully opened to make the room almost open air like the porch it had once been. Then in the front of the house, he had double-pane interior storms made to fit into the old screen pocket on the windows, making the windows triple-pane. Indow interior window inserts. These are edged in a silicone compression tubing and don’t damage the window frame. They make an original single-pane window perform like a new double-pane without damaging the old growth wood or wavy, single-pane glass. “They were original windows, and we wanted to keep them that way,” Eifler says. Wright designed more than 1,000 projects during his lifetime and believed that architecture revealed something important about a society, having famously once said, “The mother art is architecture. Without an architecture of our own we have no soul of our own civilization.” This is why preserving iconic American homes like this is so important: these structures help tell the story of who we are. This article was written by Carrie Sturrock, company storyteller at Indow. “The Craftsman Spotlight” is an ongoing series where artists, craftspeople, and their businesses are featured. This time, we’re thrilled to spotlight Indow! If you’re interested in featuring your business with The Craftsman Bungalow, please click here for more information.